I have always liked tinned sardines. When I was a young boy, I found they were the perfect food to take on a hike to Red Hill Creek, King’s Forest, or Albion Falls. Just insert the key, roll back the top, and a fine lunch was ready. During adulthood, I ate them occasionally, but somehow they never tasted as good as the ones I remembered. Then we went to Paris and an old love was rekindled. It was our first time renting an apartment instead of staying in a hotel. We found a lovely place on the Rue Charlemagne in the Marais. This meant we could make our own meals, and explore markets and food shops. We bought fresh food, but also had great fun looking at and buying food in tins. The French supermarkets have wonderful tinned food unlike anything in Canada. And we are fascinated by packaging. The packaging shown below was irresistible and, as so rarely happens, the contents lived up to the design. 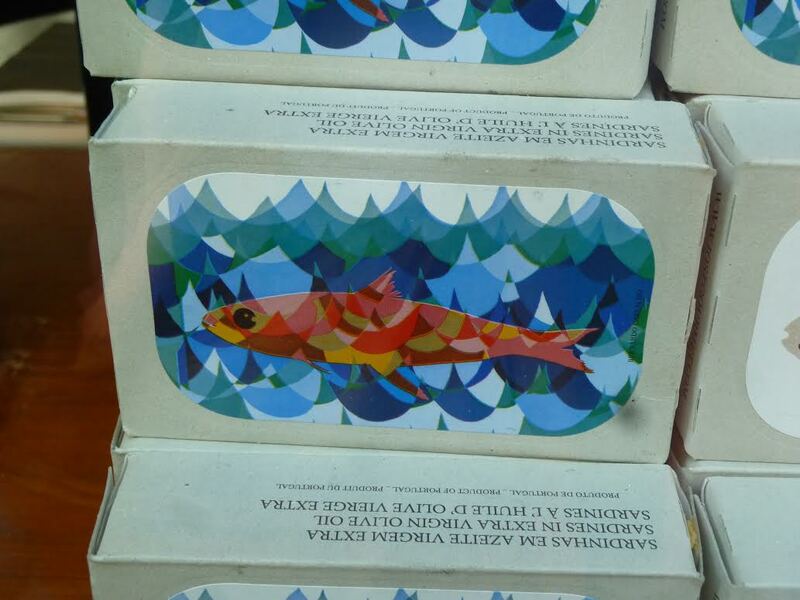 Soon no shopping expedition was complete unless we had looked for colourful sardines tins. Some of the empty ones made their way back to Toronto. They were just too pretty to throw away. Perfect for storing paperclips. As with so many things, once one becomes conscious of something it seems to pop up everywhere. We started seeing sardines wherever we looked. Moreover, we started to look more carefully at how they were packaged and presented. Who can resist the World War I aviator, his plane lost in action we presume, and carrying on valiantly in his flying sardine. Perhaps he is looking for a long lost love. 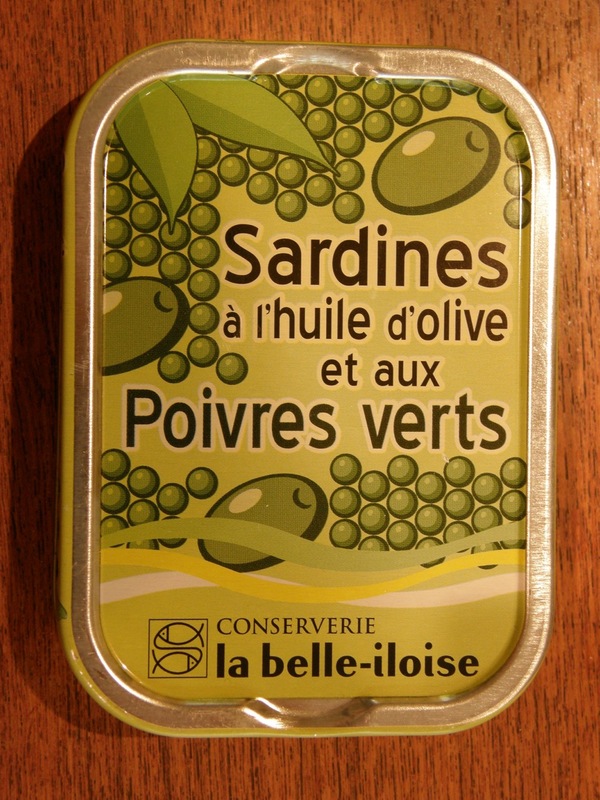 Today, most tinned sardines sold in France come from Portugal. But the design on the tins seems to be fully French, even it if is just an elegant image of a small but beautifully streamlined fish. Maybe the lack of French sardines inspired this graffiti: “Free the Sardines.” You can find many pictures of this message on the Internet. What does it mean? Some people seem to think that sardines simply need to be freed from their confining tins, but others suggest it has something to do with the overfishing that has more or less ended the French industry. 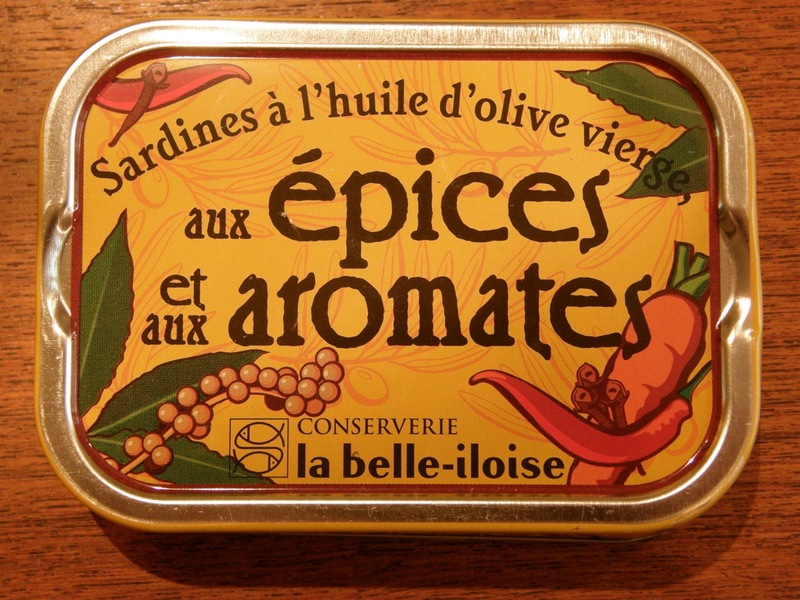 The search also showed that images of sardines seem to be a perennial motif in French arts and crafts. 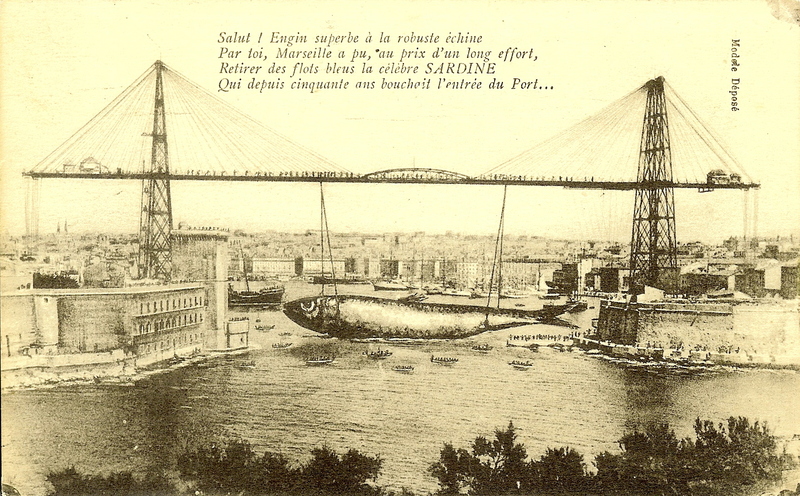 We are fond of postcards and old photos and our heightened sardine consciousness led us to a series of postcards that we described in another blog about the rivalry between Paris and the sardine fishing port of Marseille. 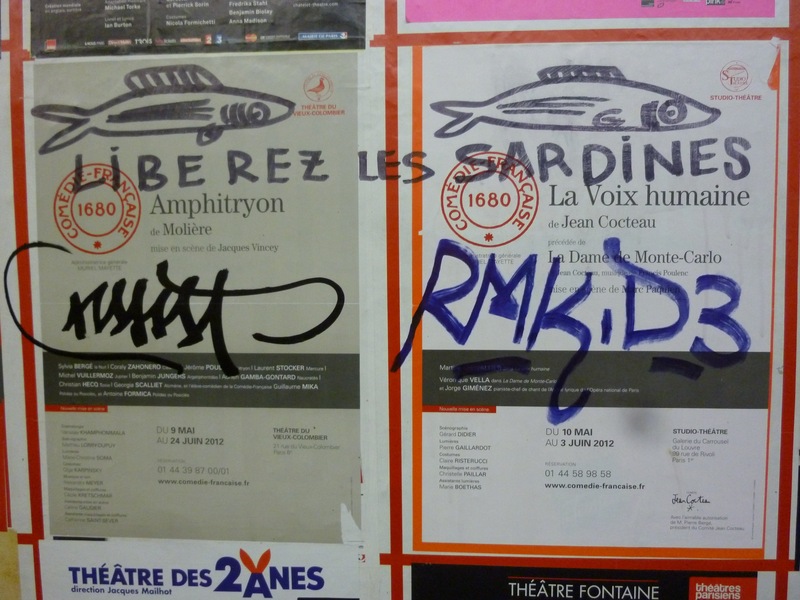 But Marseille is not the only traditional sardine port in France. Once it was Brittany that was closely associated with this fish. The word “sardine” may be given to a range of fish, including pilchards and immature herrings. Over the years, stocks of these fish have risen and fallen, and these cycles of plenty or scarcity have had an enormous impact on the communities that depend on the sardine fishery. More than once, the economy faced a Sardine Crisis. It is an old adage that armies march on their stomachs. Napoleon with his ambitious plans for empire had a lot of stomachs to march. So he offered a 12,000-franc prize for the invention of a better method of preserving food. The prize was claimed in 1809 by Nicholas Appert, who came up with a method still used today when “canning” food by sealing the heated and boiled food in airtight glass jars. The process for “canning” in metal tins might appear to have come from England where Peter Durand was granted an English patent for the process of preserving food in tin-coated metal containers. However, later research revealed that Durand was not the inventor. He was the agent for a Frenchman Philippe de Girard who, at the time, was not eligible for an English patent. Eventually the lowly sardine, which for centuries had been salted to preserve it, found itself canned and a new industry emerged. An industry based on a French not an English invention. With the new technology and an abundant supply of sardines, the tinned sardine industry flourished. Other industries grew along with it. Perhaps the most unusual was a fertilizer business, started in the early 1850s by industrialist Ernest de Molon, who used a process invented by an American chemist to produce an odour-free dry powdered fertilizer from the sardine canning factory wastes. Farmers liked the product, which was rich in nitrogen and cheaper than imported guano (accumulated bird droppings). De Molon started separate companies in Newfoundland and Spain. Then came La Crise Sardinière of 1870, when the French catch and output per French factory plummeted by about 50 percent. 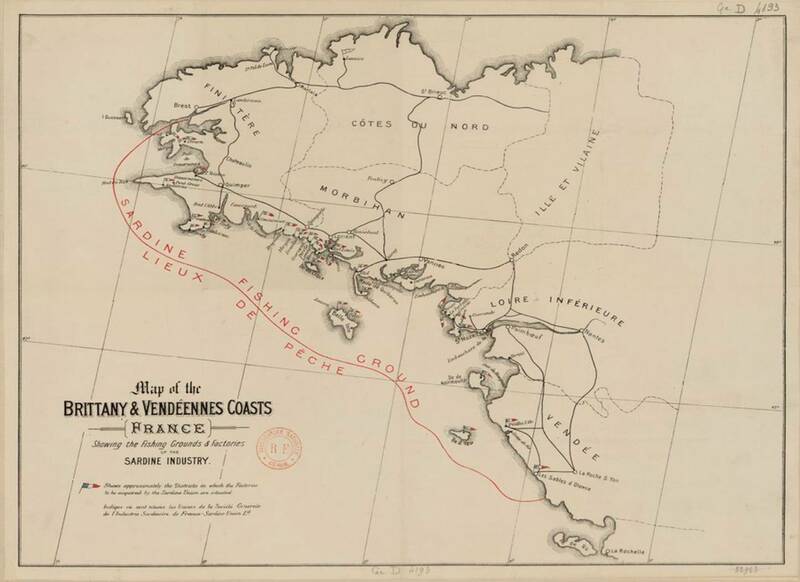 Everyone connected to the sardine industry suffered, including M. de Molon whose French fertilizer factory went into receivership to Credit Mobilier in 1877. That would not be the last Crise Sardinière. But in the meantime, times were good in the 1890s when the fish were plentiful. Then 1902 brought another catastrophic collapse. The crisis lasted until 1911. Many of those in the industry fled to other parts of France to find work. Solange Hando writes that “Breton servants were a characteristic part of the population of old Paris. 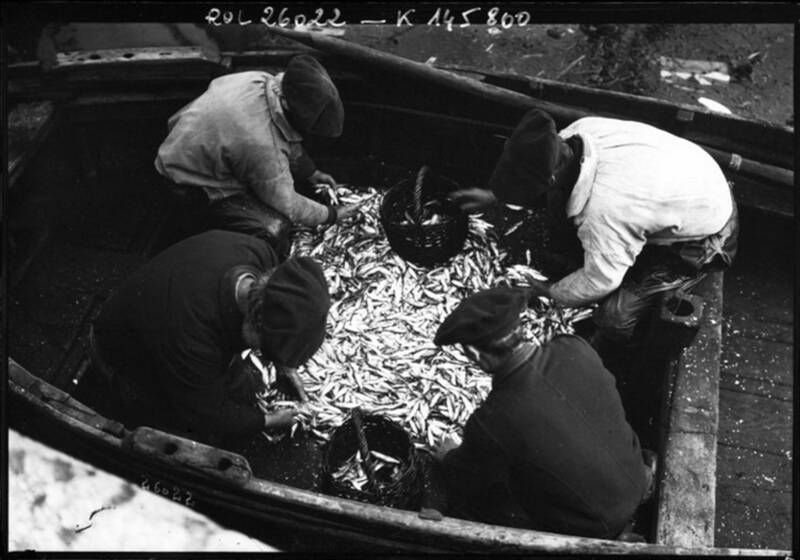 The ‘sardine crisis’ of 1902, when overfishing caused stocks [of sardine] to collapse, forced many young girls from Brittany to leave home and work in Paris. Over 100,000 of them worked as maids, but others became filles de joie in brothels.”* Other women turned to lace-making to earn a living. 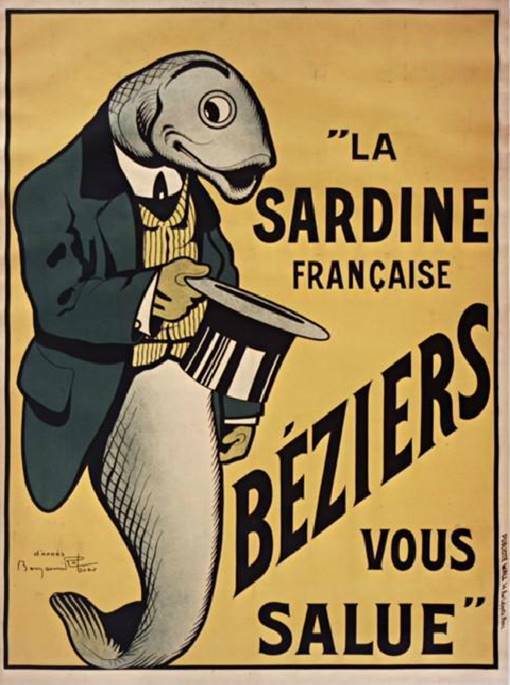 The crisis in the French sardine industry also allowed other countries to enter the market. It even led to a court battle over whether the Norwegians could use the term “Sardines de Norvège” for what the French considered a lesser product. The French lost that one. As with so many things in life, what constitutes a sardine depends on our vantage point. A sardine may not always be a sardine. 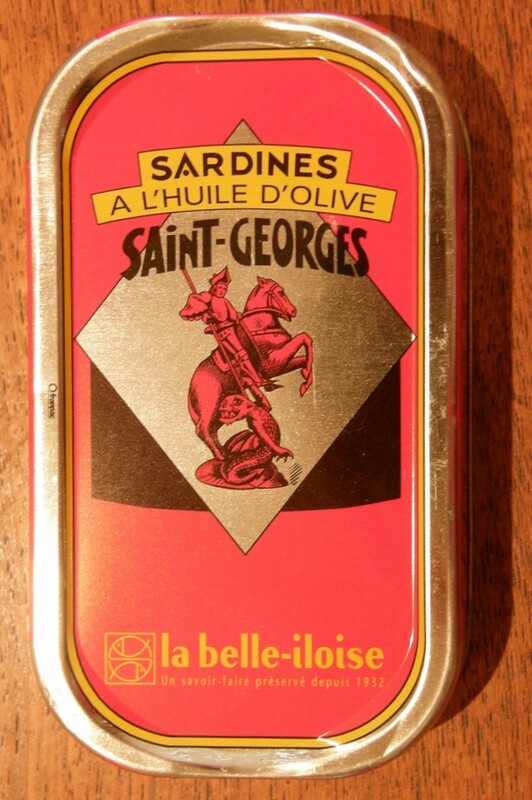 Perhaps it is not inappropriate that this can of sardines is embellished with St. George slaying a dragon. Text by Norman Ball, photographs by Norman Ball and Philippa Campsie; historic map, photograph, newspaper, and poster, from Gallica. * Solange Hando, Paris: Memories of Times Past, with paintings by Mortimer Menpes (Worth Press, 2008), p. 112. ** Quoted in Tim D. Smith, Scaling Fisheries: The Science of Measuring the Effects of Fishing, 1855-1955 (Cambridge University Press, 1994), p. 18. This entry was posted in Paris food, Paris history and tagged Concarneau, Edwin Lankester, Ernest de Molon, La Belle-Iloise, La Crise Sardinière, Le Petit Journal, Liberez les sardines, Marseille, Mimi La Sardine, Nicholas Appert, Philippe de Girard, Sardine Crisis, Sardines, Solange Hando, Tim D. Smith. Bookmark the permalink. For an excellent painting of shimmering sardines on a silver plate check out “Silver Platter with Fish” by Jeffery T. Larson. Thanks for the excellent article. I really like your blog but I am so disappointed to see that it has been degraded with the inclusion of such pathetic and tawdry ads. Glad you enjoyed the article. Alas, we have no control over the ads, which are placed there by WordPress. This is the price of a “free” blog. We are sad to hear that they are unpleasant; we do not see them when we set up the articles. Great post, Norman! I’m going to forward it to my students! Excellent piece Norman, and truly beautiful imagery. I grew up with canned sardines and saltines and by the time I left for college had tired of eating them. Later I was introduced to them as delicious fresh grilled fish in the tapas bars in Spain and couldn’t bring myself to return to the tins no matter how nicely they were decorated. I would be interested in your recommendation of tins you like in Paris and what you like to partner with them. Thank you. Very interesting post Norman. As always, i have learned much on a subject i would not have searched out on my own. 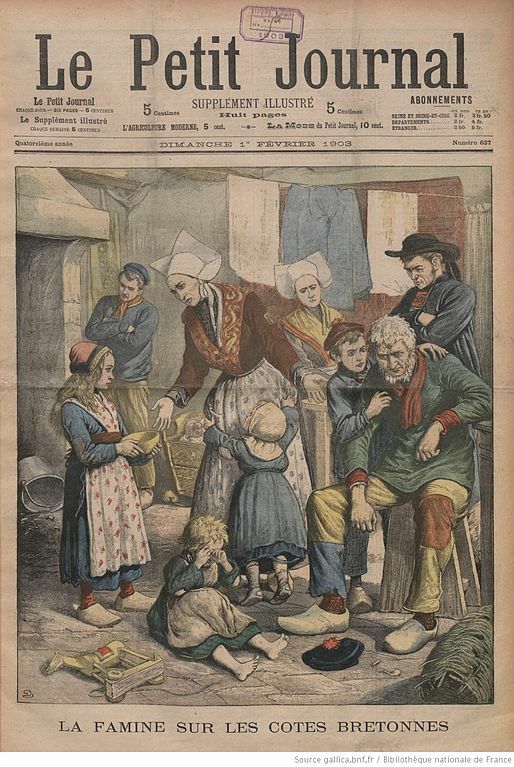 I noticed straight away the wooden shoes on the feet of the poor Bretonnes in the newspaper clipping. They are very much like the tiny, wooden souvenir shoes i have in my china cabinet. Our grandmother brought them with her when she immigrated here to Canada early in the last century after working in Switzerland for a fine expat French family. I always wondered why she brought a souvenir of Holland, and so did our mother. Now I see they were perhaps a souvenir of France after all! And now, I think I shall go and open a can of sardines! May you savor some Rodel sardines while you are in Paris; I’m definitely jealous! Bon appetite! Thanks for the link. We will definitely find Rodel sardines next time! Wonderful off the wall piece. Thanks for this. Lovely piece. 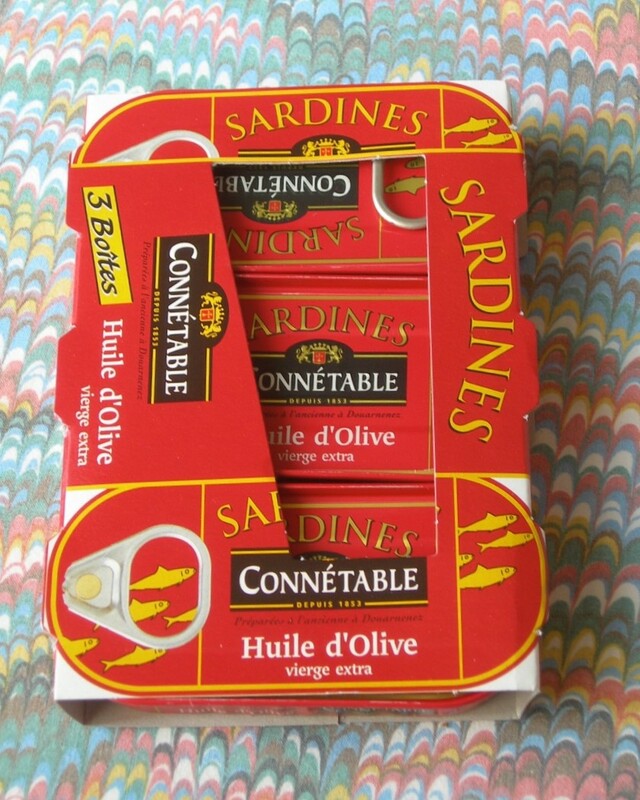 Besides the tin designs, I have a sneaking suspicions that the actual sardines from France (and anchovies and other tinned fish) are a better quality than the ones we get in Ireland or Britain. Fatter and juicier. Have you tried tinned grilled sardines? They are just as tasty and don’t have the disadvantage of all that fishy oil to dispose of. Btw, I was completely unaware that your blog had ads, since I have ad blocker switched on. I recommend it to anyone who isn’t interested in seeing advertising. Thanks for another lovely article. Here in the Pacific Northwest we have an abundance of fish and I love to can the exquisite salmon and tuna that my husband catches. I think he uses sardines for bait, but you’re delicious article has made me consider trying the tinned ones! 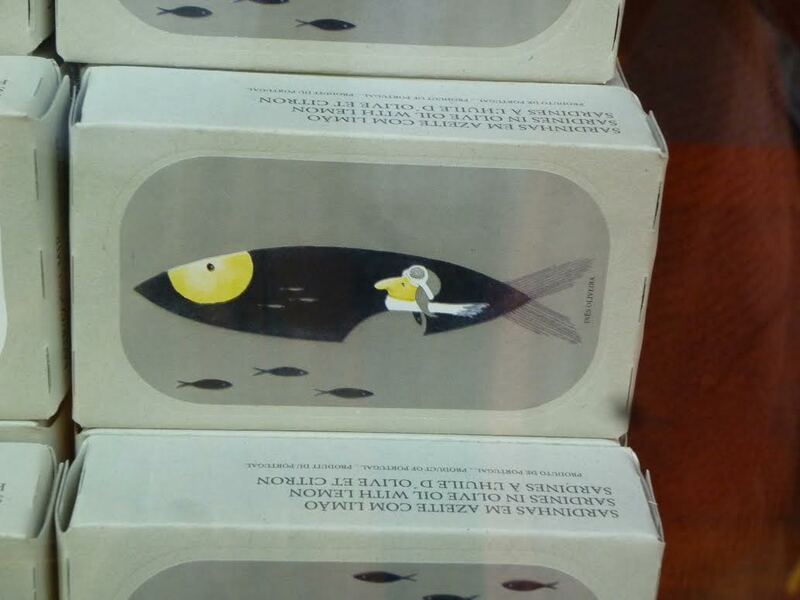 We recommend a lovely little book called “Tin Fish Gourmet” by Barbara-Jo Macintosh. Full of ways to enjoy sardines and other tinned fish. Libérez les sardines comes from a text by anarchist singer Léo Ferré. = Legalize drugs and there won’t be drug dealers anymore. I don’t really know how I get there, but your blog is very interesting, thank you! It makes me take a fresh look at the city I’ve been living in for so long.